However, merge the reflective light beams to be as segments of one immense parabolic source, and what do you have? At first, it looks like all beams are aimed differently, but as a whole, the light beams aim a common light at a common center. Their correct merger sparks a critical temperature, brings about a new substance – plasma – and bursts into flames. 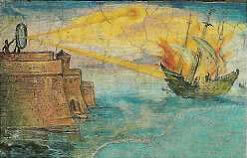 According to legend, Archimedes also set enemy ships on fire by aiming polished bronze mirrors at them. His contemporaries were so stunned by this phenomenon that even today, thousands of years later, people still talk about it. Are Kabbalists for War or for Peace? 1. Did this interview really take place? 2. If it did, do the below quotes accurately portray what you said? 4. Finally, even if we agree, and accept the fact that we can’t see the proper course of action because we haven’t yet crossed the Machsom (barrier), shouldn’t a Kabbalist understand that such statements won’t influence Israel’s politics? Did you truly expect people to pay attention to your advice? My Answer: This wasn’t an interview, but an article I wrote called, “The Threat of Destruction,” and yes, I am for preventative actions, like what Israel did in the Six Days War. It’s obvious that if you’re being attacked, you have to defend yourself. But the question is: Who will be the first to strike? The aggressor? Or the party for whom the strike is intended? Imagine that a group of criminals have surrounded your son and are about to kill him – and you’re advising him to wait for peace. Or that your daughter is about to be raped! Would you stand around and reason about it, or would you take all the necessary measures to prevent the attack? Evidently, in our case, you don’t feel close to the victims, the way you would with your children. Egoists, who can’t perceive others as themselves, are calling for inaction and hence are the evil of this world, allowing the killers and rapists to multiply. And as to no one taking notice of my advice, you’re incorrect about that. People, just like you, took notice back then and are taking notice now. And I didn’t expect anything less. Reactions such as yours bring understanding. You can love only once you acquire power, severity and mercy – in equal measure. It’s because love is the most corrected property – the fourth phase of the Creator’s revelation. A question I received: It’s been a while since we had the Kabbalah congress in Israel, but I still can’t shake off the feeling of how simple and open you are. I’ve always thought, like most people, that sages conduct themselves differently; that they’re overburdened by wisdom and need to evoke awe. After the congress, I find it harder to respect you, and without being able to respect you, I don’t have the same energy I once had to trust you and what you teach – that it’s the path to my future. What would you suggest I do? My Answer: Baal HaSulam writes, in his Future Generation manuscripts: “The masses think that he who is in contact with the Creator stands above nature and they need to be afraid of speaking to Him or at the very least being near Him. For such is the nature of man: to fear what transcends nature’s bounds. However, in reality, there’s nothing more natural than attaining contact with the Creator, for He is the master of nature. Truly, every creature is in contact with its Creator, although it neither knows nor feels it. He who merits contact with the Creator merely obtains the knowledge of it, for there is nothing new in the universe, and it’s only that he was ignorant of it beforehand.